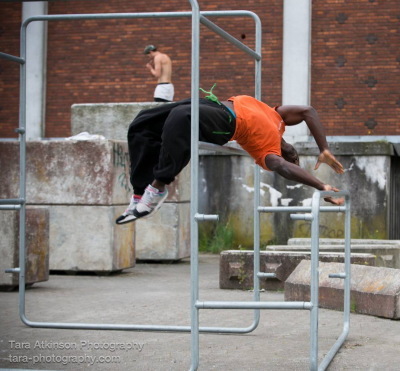 esprit concrete aims to aid individuals to gain a deeper understanding of their emotional, psychological and physical states through movement and self-reflection based on an Art Du Deplacement and Parkour experience. We offer classes that, if the client chooses, allow adults and young people to work in conjunction with the coaches and therapist towards their goals, set in collaboration with the therapist during the initial class with us. Each class consists of a concept driven warm up, technical/physical training, cool down and discussion/reflection. The coaches will emphasise the concept of safety and self-preservation, risk management, unity as a group, support to less able members, body mechanics and basic physiology, respect of people/materials and commitment/decision making. These personal development style sessions are ADD and Parkour classes that aim to challenge the participants physically and mentally through various tasks, physical challenges and group activities. The participants will be introduced to mindfulness, fear management, problem solving and group interactions to help them build their self-confidence, community spirit and improve their autonomy as an individual. The classes are held outdoors, in the community, to encourage the participants to interact positively with their surroundings and also help them overcome the barriers, physical or mental, that the neighbourhood may represent to them. As part of the sessions, the therapist will work with participants to explore emotional and psychological processes as they arise. Participants will learn to identify, manage and change any thoughts/feelings/behaviours with which they are faced throughout the session. Furthermore, the therapist will look to assist participants to apply any stratergies that they find useful during the sessions across applicable areas of their life, as there is often crossover between the two. In this way, the classes aim to develop participants physically and mentally to strengthen them through their personal parkour journey. esprit concrete believes that what esprit concrete’s style of classes provides will benefit individuals and the community immensely. We believe that mental and physical health are closely linked, and by promoting wellbeing and that by aiding individuals to find themselves and take responsibility for their actions, they will go back and help the community grow stronger.